Vendors smilingly greeted our tour as we made our way down the street, obviously happy with La Cocina and their role in the event. Photo by Joe Rivano Barros. 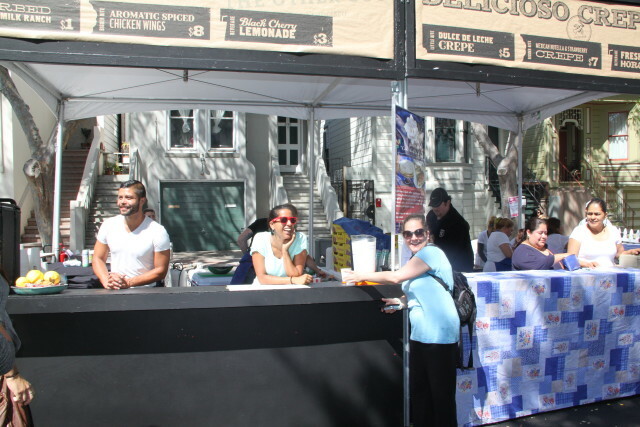 La Cocina is kicking off the San Francisco Street Food Festival this Saturday at the Power Station in Dogpatch. Presale entry prices start at $6 and attendees can eat and drink to their heart’s delight between the hours of 11 a.m. and 7 p.m. More information available at Street Food Festival’s website. Spread across nine locations in the Mission, the Paseo Artistico art stroll will feature live music, exhibits, workshops and art classes. This month’s stroll focuses on artists of indigenous backgrounds and their art. More information at Paseo Artistico’s website. The SPCA is celebrating 150 years in San Francisco and will do so with a large outdoor event where you can sign up for free pet adoptions, yoga classes with your cat, paint your pet and more. There’s a “cuddle dome” where you can let puppies crawl all over you and there’s music provided by live bands along with a beer garden. This event is free, but requires an RSVP. In the 1850s, author John Rollin Ridge wrote about a Mexican bandit named Joaquin Murrieta that operated in Gold Rush Era California. He was described as a Robin Hood-esque bandit that would later serve as the inspiration for Zorro, but there still remains some mystery as to whether or not Murrieta died as portrayed in Ridge’s book. The play by Teatro Latino de SF explores what happened later in Murrieta’s life and the injustices he fought against. The play runs every weekend until Oct. 21 and tickets start at $25.